Guillermo del Toro, The Jim Henson Company and Pathe are moving forward with a stop-motion animated 3D Pinocchio. It is a feature adaptation of the Carlo Collodi fairy tale and will reportedly be edgier than the 1940 animated Disney classic. Gris Grimly is set to co-direct with Mark Gustafson, and production will begin later this year. The basis of this project was Grimly's 2002 illustrated book of of Collodi’s tale. Del Toro and Matthew Robbins crafted the story based on a script from Robbins, who has collaborated with del Toro on scripts for Mimic, the Don’t Be Afraid of the Dark remake, and the upcoming At the Mountains of Madness. The director is producing the feature along with Jim Henson Company’s Lisa Henson and Jason Lust, and Allison Abbate. Gary Ungar is exec producer along with Pathe’s Francois Ivernel and Cameron McCracken. This version will be for audiences 10 years and up, and will be scarier than the Disney film. Australian musician and film composer Nick Cave will serve as the music consultant for the project. 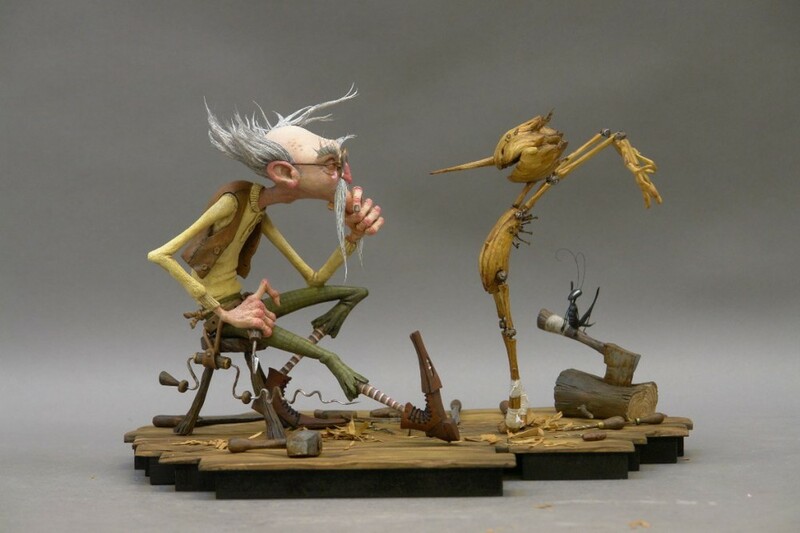 The puppets and 3D elements will be developed with the UK's MacKinnon and Saunders, that did The Fantastic Mr. Fox, Tim Burton’s Corpse Bride, and the upcoming Frankenweenie. The photo below gives us an idea of the feel which shares a core theme from the Disney film: "the innocent whose inherent goodness, purity and love for his father saves him from a series of harrowing adventures and temptations in his quest to morph from wooden puppet to real boy." “We’ve designed key frames and characters, we know the mood and the feel, we’ve created a bible. Shooting stop motion animation takes a lot time, but we’ve got the right team and I will be there for daily or weekly updates on how it’s going."